We accept all major credit cards, PayPal, cash, certified money orders, and cashiers checks. Use our fast, easy, and secure way to make payments on accounts, pay invoices, engine deposits, custom items, and more. Click the link below for our Account Payment Item. Simply choose the amount from the drop down, enter your name or account number, and add it to your cart. We will confirm the payment is applied to your account. If you need amounts other than what is listed simply add as many items in any amount to the shopping cart. 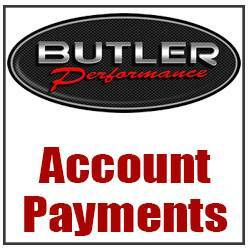 Butler Performance understands that flexible payment options can help you get the things you need without breaking the bank. With Butler Flex Pay, you make an initial deposit, and then payments can be made interest free over time until the items are ready to ship. We can create payment schedules that line up with our production and build times or a flexible payment schedule to work with your project timeline. So when you are ready for your order, it will be ready to ship and paid in full. Still have a balance when your order or project is ready? No problem, you can then use one of our other payment or financing options so that you can have your project on the road in no time. Tired of waiting for money to become available for that new performance engine or parts upgrade? Budget busted racing last weekend? Want to step up to higher performance than originally planned? The wait is now over with the new Butler Performance Card. You can get the parts, engine, or upgrades you dream of today. Quick and easy online approval process in minutes. It's always easier when you have the money available. Simple, no-interest, pay over time options available now. Apply online by clicking the link above. account number and we will do the rest. 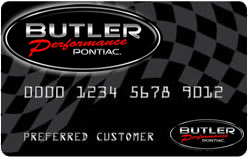 On qualifying purchases made with your Butler Performance Card. Interest will be charged to your account from the purchase date if the promotional purchase is not paid in full within the promotional period. Minimum monthly payments required. *Offer applies only to single-receipt qualifying purchases. No interest will be charged on the promotional purchase if you pay the promotional purchase amount in full within the promotional period which may be 6 or 12 months. If you do not, interest will be charged on the promotional purchase from the purchase date. Depending on purchase amount, promotion length and payment allocation, the required minimum monthly payments may or may not pay off purchase by end of promotional period. Regular account terms apply to non-promotional purchases and, after promotion ends, to promotional balance. For new accounts: Purchase APR is 29.99%; minimum interest charge is $2. Existing cardholders should see their credit card agreement for their applicable terms. Subject to credit approval. 0% interest if paid in full before promotion expires. Have a bigger project than the offers allow? No problem. Combine one of the No interest offers with any other payment method including Butler Flex Pay for easy payment terms designed around your project deadline and budget. Special financing offers give you the flexibility to buy more of what you want and choose how you want to pay in full, or by spreading out your payments over time. (Offers vary depending on where you shop and how much you spend). There are no account numbers to enter or long credit applications to fill out. PayPal Credit is available within the checkout process. Plus, when you link your PayPal Credit and PayPal accounts, you can use PayPal Credit (and get more time to pay) at most places PayPal is accepted;both offline and online. Simply select PayPal Credit as your payment choice during checkout. You’ll be asked to provide your date of birth and the last 4 digits of your Social Security number, and then to agree to the terms and conditions. You'll know within seconds if you are approved. PayPal Credit is subject to credit approval.